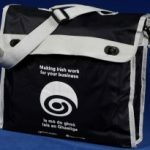 If you are interested in taking the first steps on the road to introducing Irish into your business, then there’s no better place to start than here. 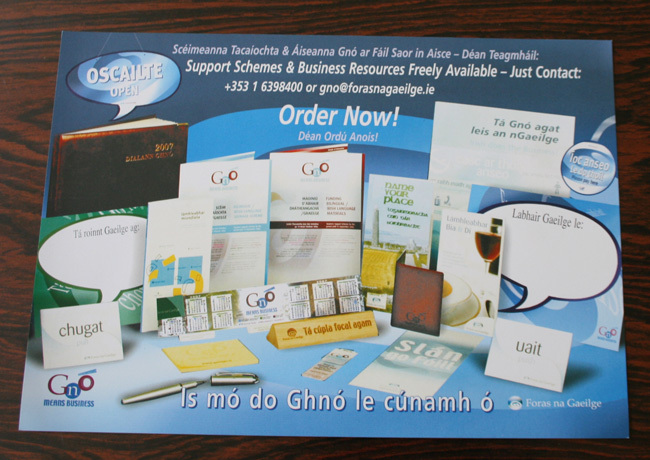 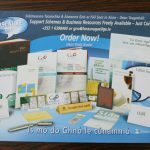 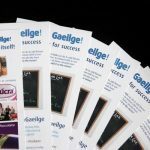 Foras na Gaeilge provides information sheets, terminology handbooks, Irish and bilingual signs as well as stationery free of charge. 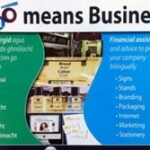 Items can be ordered individually or everything can be ordered together as a single package. 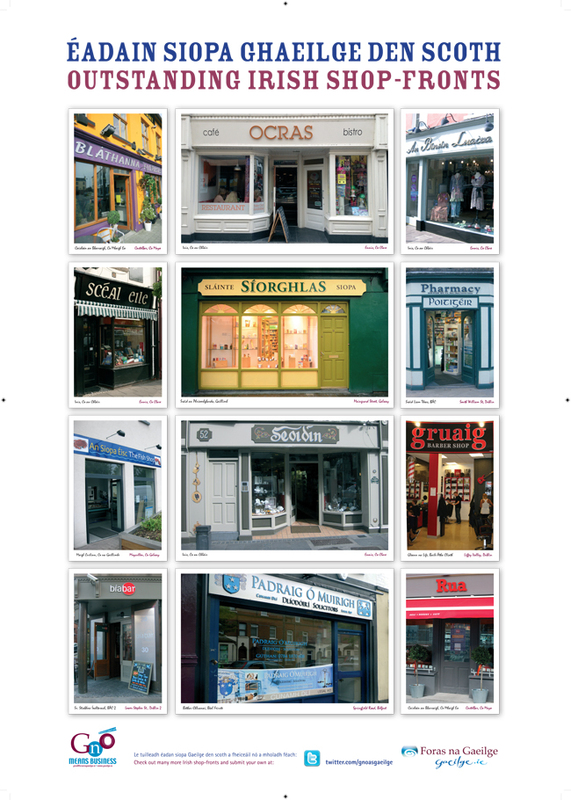 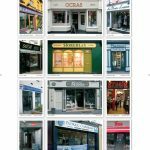 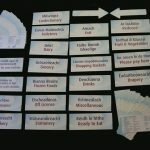 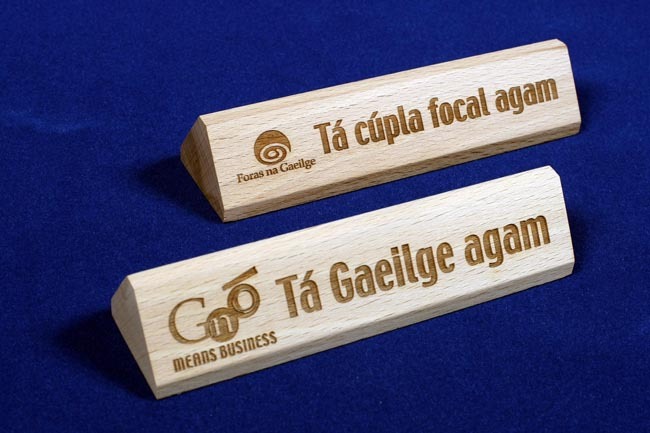 You can gaelicize your shop with these bilingual self-adhesive signs. 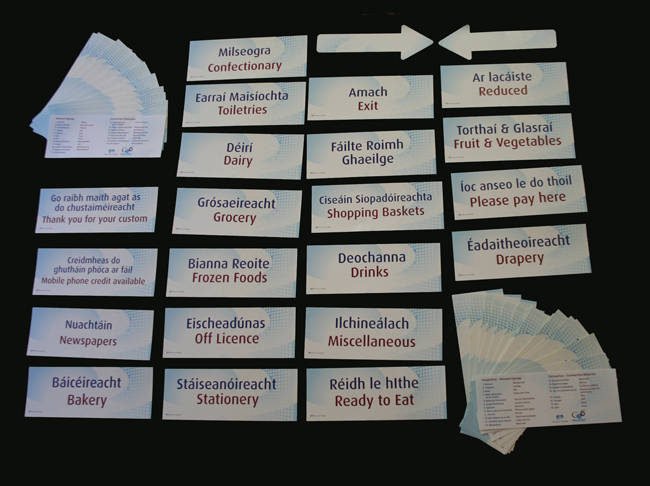 Enclosed in the pack are the following signs: Please pay here, Thank you for your custom, Mobile phone credit available, Newspapers, Bakery, Confectionary, Fruit & Vegetables, Toiletries, Stationery, Off Licence, Frozen Foods, Dairy, Grocery, Ready to Eat, Drapery, Reduced, Miscellaneous, Drinks, Shopping Baskets and Fáilte Roimh Gaeilge. 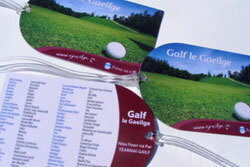 Bilingual labels for golf bags with a small glossary on them so that you can complain about your bad lie or celebrate a birdie in Irish across the green fairways of Ireland and beyond. 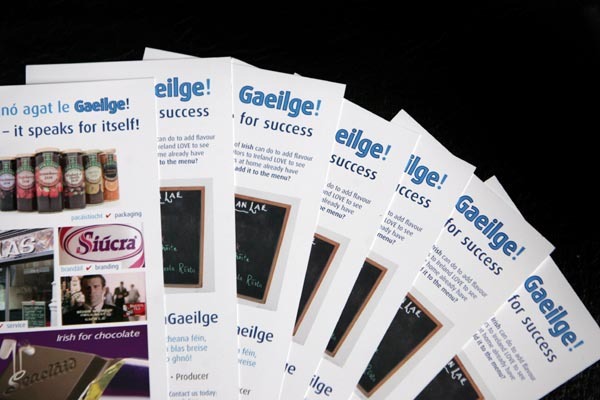 If you want to start advertising in Irish, this information leaflet will come in useful. 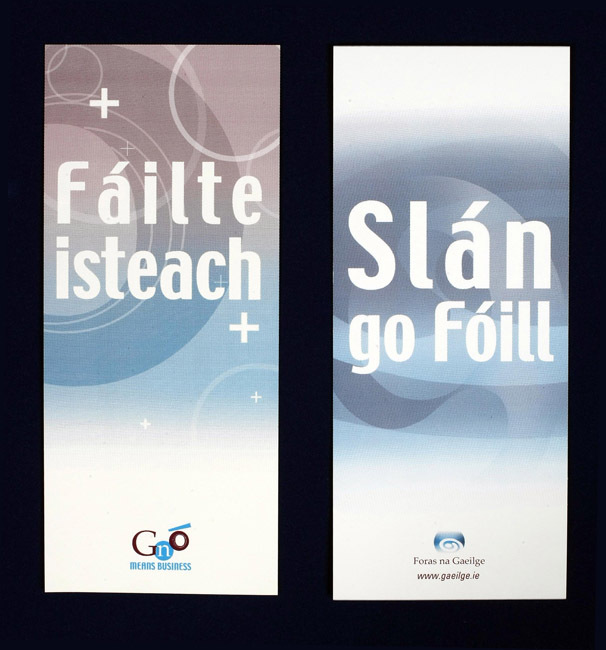 It gives samples of Irish language signage, advertising and branding as well as useful phone numbers where you can get help and advice from beginning to end. 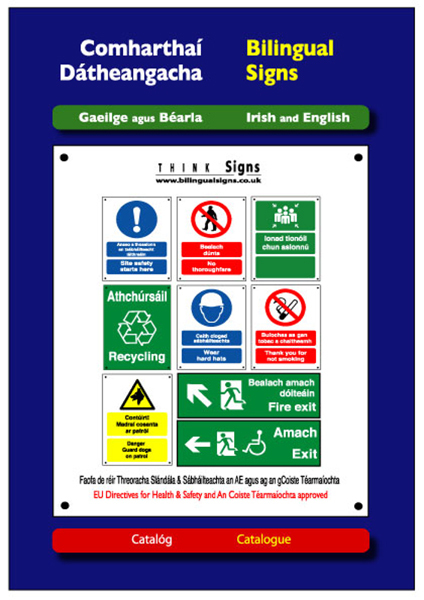 This is a catalogue of bilingual signs that have been approved according to EU Directives for Health & Safety and by the Terminology Committee. 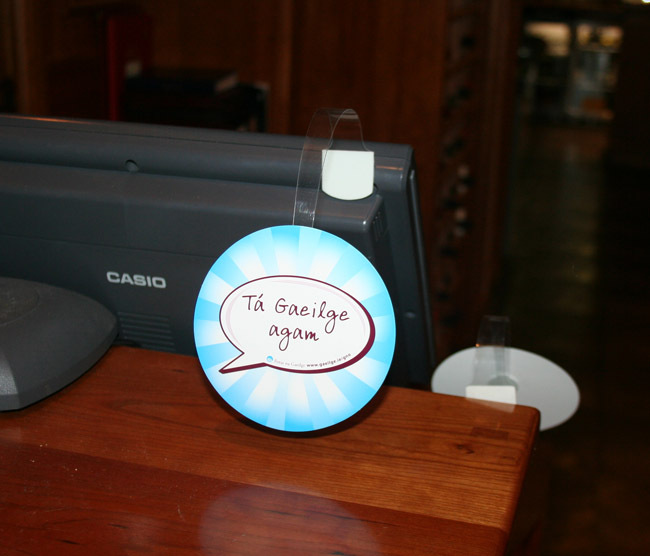 This sign can be used to let customers know who in the business has fluent Irish or a few words. 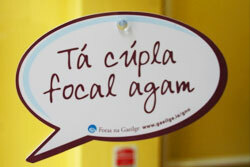 By sticking this window sign up you are letting the public know that you have the ‘Cúpla Focal’ and are willing to use it. 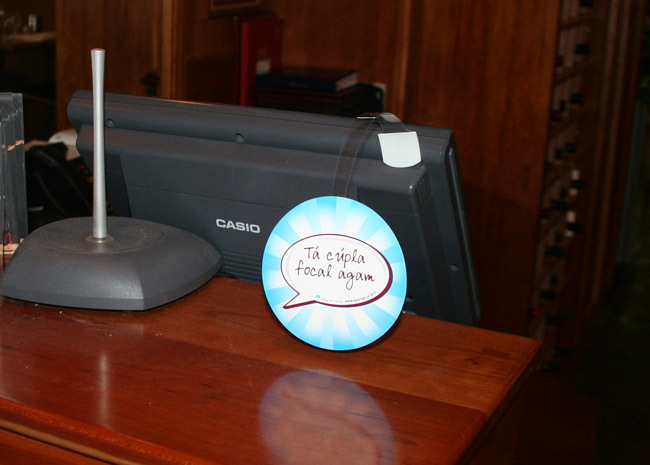 You can stick this sign to the window by use of the suction pad attached. 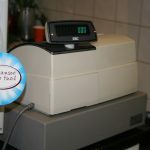 With this sign, your customers will know where to pay. 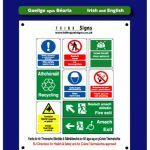 This is an adhesive sign you can put by the service desk or till or counter to encourage your customers to seek a service through Irish. 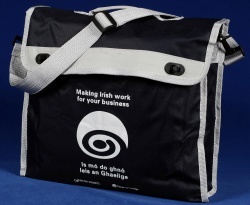 Keep your belongings together in this canvas bag. 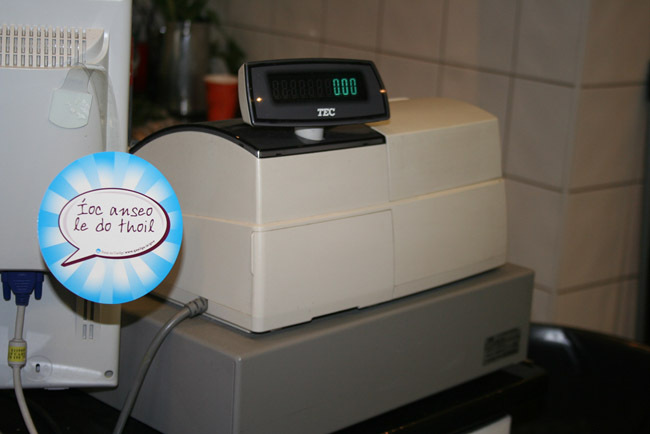 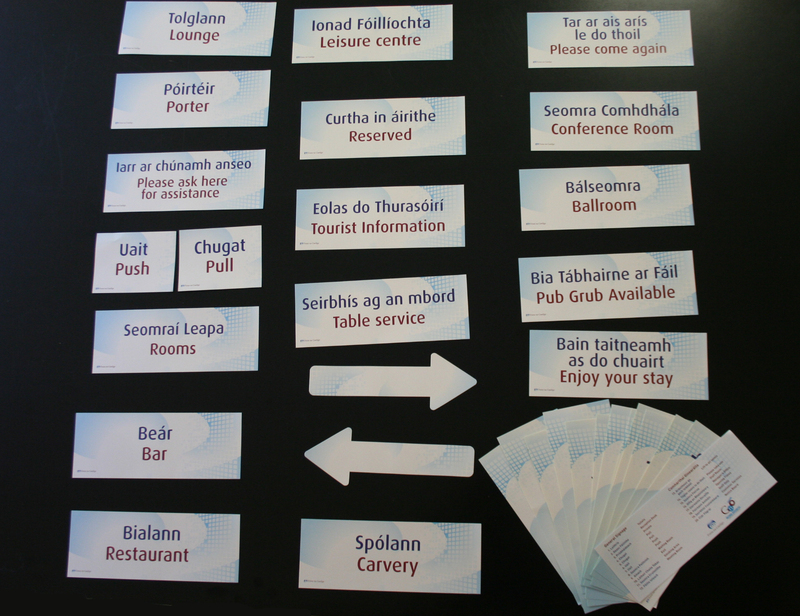 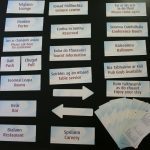 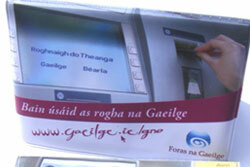 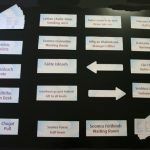 You can gaelicize your bar/café/hotel/restaurant with these bilingual self-adhesive signs. 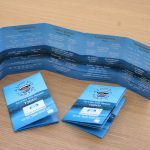 In the pack you will find the following signs: Restaurant, Lounge, Bar, Enjoy your stay, Tourist Information, Leisure centre, Carvery, Please come again, Porter, Pub Grub Available, Table service, Ballroom, Reserved, Rooms, Conference Room, Please ask here for assistance, Pull X 2 and Push X 2. 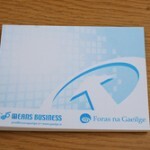 This notepaper will come in very handy if you want to write a little note for yourself or for someone else. 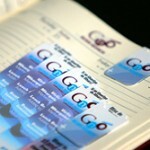 It has an adhesive strip on the back so you can leave it somewhere it cannot be missed. 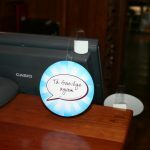 Wear this glossy badge to let customers and fellow staff know that you have a few words. 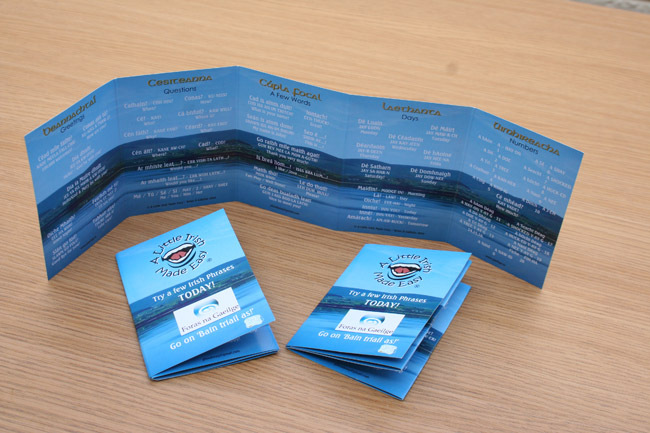 You can keep your important business cards in this useful wallet. 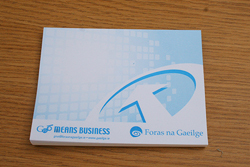 This info card details the resources and support that is available to the business sector from Foras na Gaeilge. 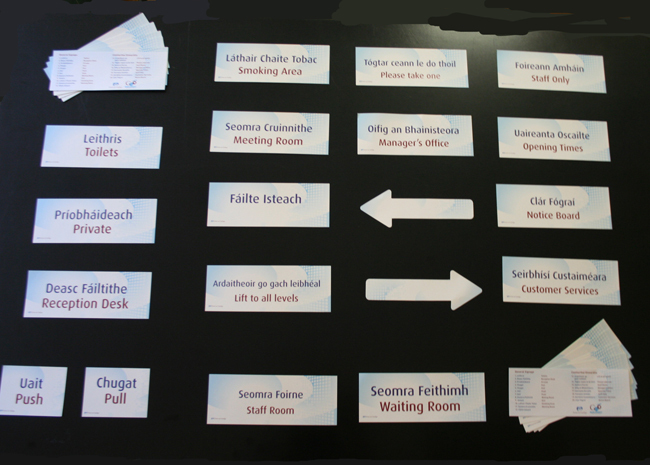 This is a sign you can leave by the service desk or till to encourage your customers to seek a service through Irish. 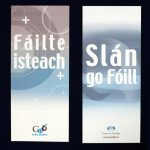 Welcome people into your shop and bid them farewell on their way out with this two-sided adhesive sign. 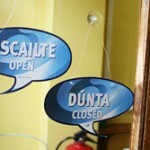 With this sign your customers will know when your shop is open. 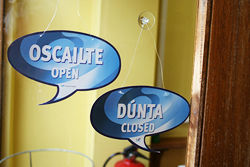 With the wire on the sign, it is easy to turn the sign around to indicate that the shop is closed. 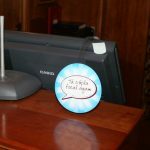 This is an adhesive sign you can put by the service desk or till to show your customers that you have a few words and that you are willing to use them. 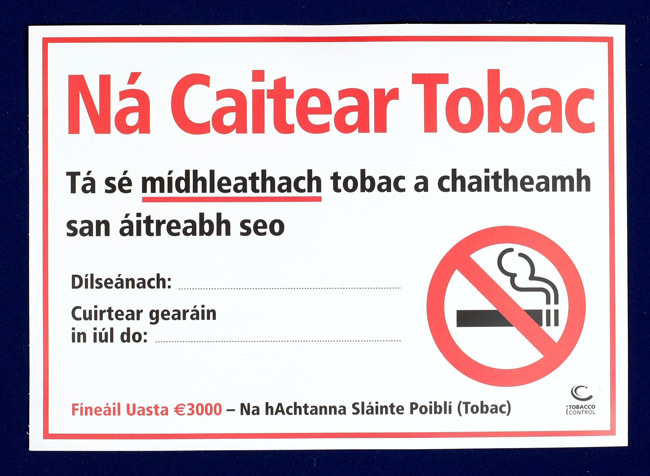 Let everyone know that smoking is not permitted in the building. 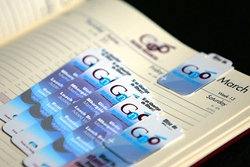 You’ll know what was the last page you read with this magnetic bookmark. 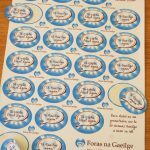 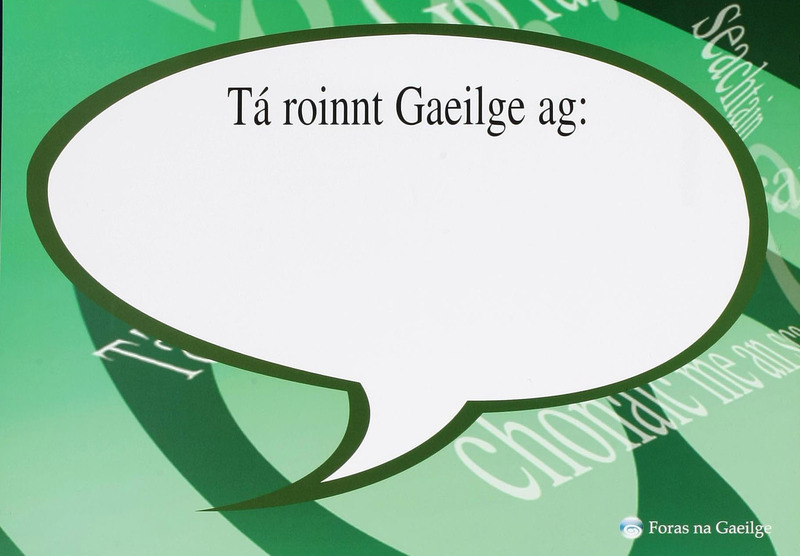 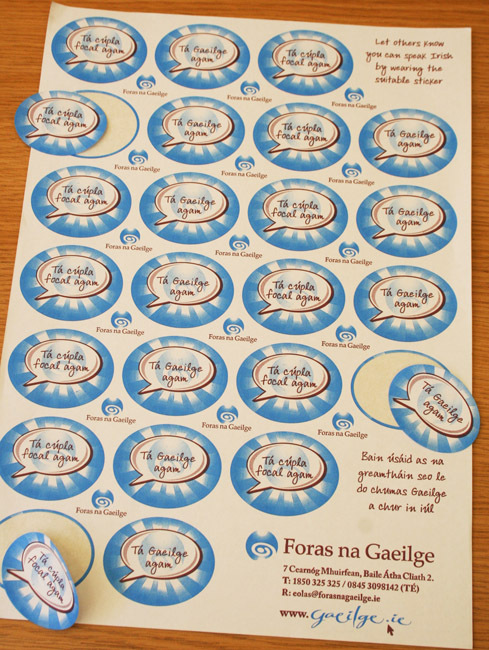 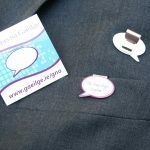 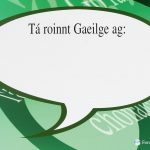 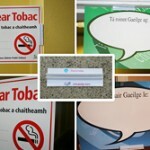 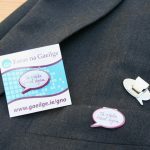 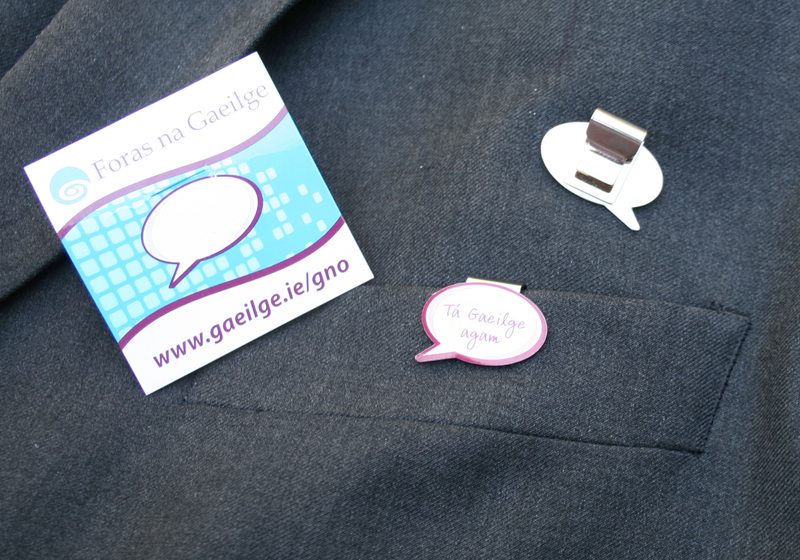 Use these stickers (‘Tá Gaeilge agam’ and ‘Tá cúpla focal agam’) to show your ability in Irish. 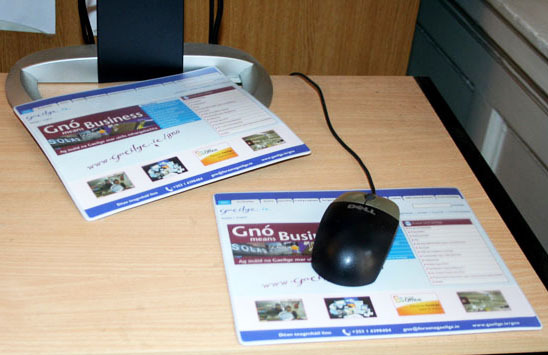 This neat mouse mat will be a helpful aid to anyone who uses a computer. 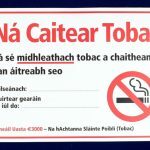 Toilets, Reception Desk, Private, Pull X 2, Push X 2, Waiting Room, Exit, Smoking Area, Meeting Room, Fáilte Isteach, Lift to all levels, Please take one, Staff Room, Manager’s Office, Opening Times, Staff Only, Customer Services and Notice Board. 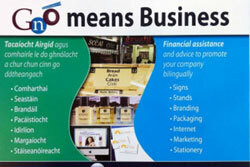 This is an information leaflet on the ‘Gnó means Business’ campaign. 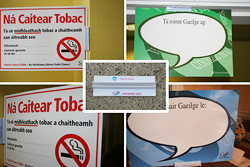 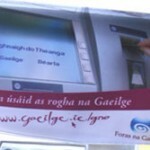 It gives examples of Irish language marketing material and reasons why Irish would be beneficial to your business. 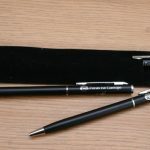 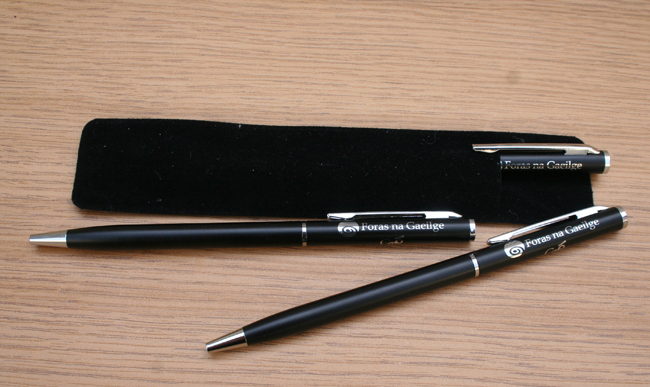 This is a stylish metal ballpoint pen. 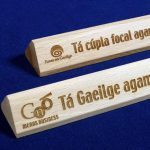 You’ll want to write in Irish with this pen! 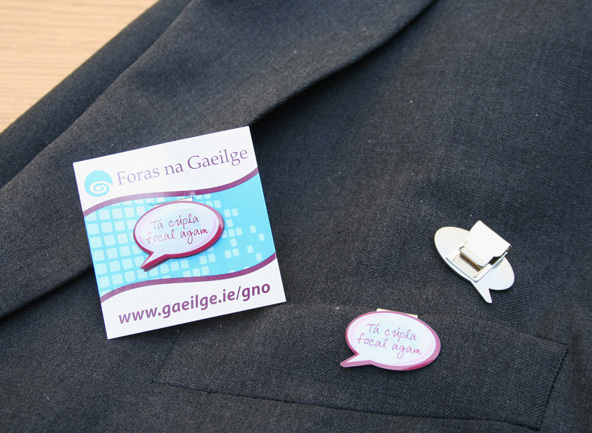 Wear this glossy badge to let customers and fellow staff know that you can speak Irish. 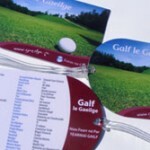 There are many uses for this Self-Adhesive Holder. 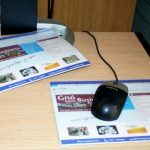 You can have your notes close to your computer when you are typing or you can use it to hang up notices.